Strutmasters 1992-2002 Mercury Grand Marquis Rear Air Spring To Coil Spring Conversion Kit With Front And Rear Shock Absorbers is the perfect solution to your air suspension problems. Designed to be very affordable, you can convert your air suspension to use our exclusive passive shocks and coil springs for less than the price of replacing one Original Equipment air spring at the dealer. 1992-2002 Mercury Grand Marquis Air Suspension Conversion Kit With 4 Shocks (FA2RF) is the perfect solution to your air suspension problems. Designed to be very affordable, you can convert your air suspension to use standard. We are The Suspension Experts, and we know all about the assorted parts that make up the faulty air suspension system on your 1992-2002 Mercury Grand Marquis. We created an affordable and high-quality solution- an air to non-air conversion kit. The kit eliminates the dependence on all the air suspension parts functioning properly and in sync, at all times. The kit is a direct replacement and includes four replacement shocks and two premium American-Made coil springs that will delete the need for plastic and rubber air springs in the rear of the vehicle. 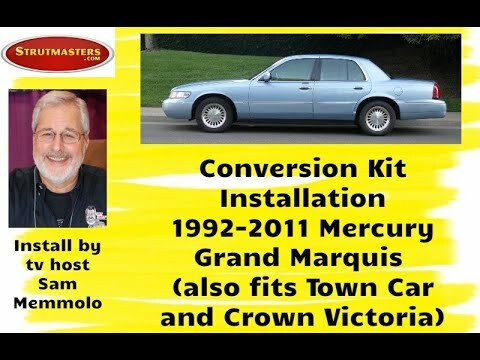 The kit was designed to be more affordable and reliable than the original Grand Marquis parts. We back the product with our limited life-time warranty. DIYers, it√¢¬Ä¬ôs time to celebrate! This kit is installed in as little as one hour per wheel, and the suspension warning light will turn off after about thirty minutes. No modifications are needed before installing this kit. Each kit comes with easy to read instructions that include pictures and helpful support information. Our experts have uploaded videos of real life installations on our exclusive YouTube channel- check those out as you perform the repair yourself! And if that isn√¢¬Ä¬ôt enough for you, we have in-house technicians who are available to answer any questions you may have about your Grand Marquis bad suspension replacement. 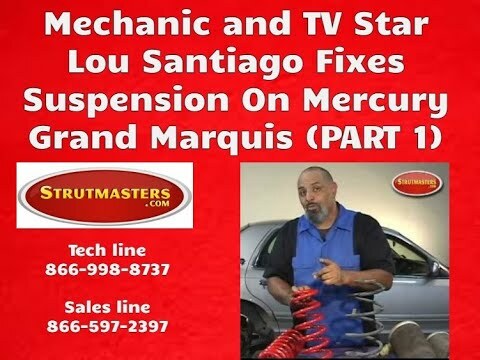 How Do I know If My Grand Marquis Air Suspension is failing? Hopefully your 1992-2002 Mercury Grand Marquis does not have a suspension total failure yet. Maybe that‚Äôs why you‚Äôre here- you think you notice some common signs of a failed or leaking air suspension, but you aren‚Äôt sure. It‚Äôs good to know what you‚Äôre looking for so you can remedy the situation before your Grand Marquis looks like it‚Äôs been ‚Äúslammed‚Äù to the ground. The most commonly seen sign is a sudden noticeable uneven height difference between different sides of the Grand Marquis. This might look like a sagging rear end or maybe a lean from one side to the other. Some drivers say their Grand Marquis looks like it is ‚Äúsquatting down lower than usual.‚Äù You may have noticed a suspension warning light or message illuminated on the instrument cluster- please don‚Äôt ignore it. It could mean a repair or replacement is needed immediately. Listen closely to your air compressor- if it ceases working or is running too often (will be very loud and noisy), then you probably do need to get things checked out as soon as possible. If the rear of the vehicle is sitting way too low, this means the compressor is either completely done or it can no longer make enough air to keep the vehicle up.¬† A complete overhaul of the air suspension system is needed at that point.¬† Instead of buying replacement parts that are guaranteed to fail, 98% of Strutmasters customers choose our conversion kit -- a permanent and money-saving solution to the problem. + Rear Air Springs ($90/air spring) + Shocks ($60) + Compressor Assembly w/ Dryer ($210) = Over $450 WITH NO GUARANTEE these will fix the vehicle¬†(does not include replacing electronic components that are known to fail such as the height sensors). 1992-2002 Mercury Grand Marquis Air Springs (x2) - commonly referred to as air bags, a plastic and rubber bag that is fitted on top of the strut that uses pressurized air as a cushion instead of a metal coil spring to hold a vehicle off of the ground and off of its wheels. These are the number one cause of all air suspension leaks. All air springs all go bad at about the same rate. If one is leaking, the others will not be far behind. For a proper repair, all of them need to be replaced at the same time. 1992-2002 Mercury Grand Marquis Shock Absorbers (x4) - has metal tubing filled with gas-charged hydraulic fluid that is connected to the wheel of a vehicle in order to reduce the effects of vertical travel on a rough surface which controls the bounciness, and therefore comfort, of a vehicle. 1992-2002 Mercury Grand Marquis Coil Springs (x2) - the front of the town car already has coil springs, that√¢¬Ä¬ôs why we not only offer replacements for weakened coil springs in the front, but our conversion kit puts the same, sturdy design on the rear of the vehicle. 1992-2002 Mercury Grand Marquis Height Sensors (x2) - a linkage located near each wheel of a vehicle with any electronic suspension that, either mechanically or electronically, constantly measures the height of the vehicle, and reports this information back to the control module so that the computer can identify if changes in height need to be adjusted accordingly. The ride height sensor is a moving part, and like all moving parts, they will eventually wear out. 1992-2002 Mercury Grand Marquis Air Lines- tubes that run from a compressor to the air which carry pressurized air to the air bags in order to adjust the height of the vehicle, respectively. 1992-2002 Mercury Grand Marquis Solenoids (x2) - usually L-shaped, these plastic components connect the electrical connection and lines of suspension components to the suspension control module on vehicles with active suspension. The solenoid regulates the air pressure for each air spring. Solenoids start to leak as they wear out causing the vehicle to sag or to lean. This will cause the ride height sensor to send a signal to activate the compressor in an attempt to inflate the air suspension and level out the vehicle. This excessive work load will eventually lead to total failure of the compressor. 1992-2002 Mercury Grand Marquis Compressor Assembly- creates/sends pressurized to active suspension components. When the air suspension starts leaking, the compressor/pump starts working harder to try to keep the system inflated. By the time air suspension leaks down completely, sitting the vehicle on its tires, the compressor will either have failed or be well on its way to full failure. Buying replacement struts and taking the time to install them only to find out the compressor still needs to be replaced can be very frustrating, time-consuming, and expensive. 1992-2002 Mercury Grand Marquis Dryer- prevents moisture build-up inside of air suspension parts. 1992-2002 Mercury Grand Marquis Suspension Control Module- a computer which is responsible for the operations of the air suspension system and maintaining the vehicle√¢¬Ä¬ôs correct ride height. 1992-2002 Mercury Grand Marquis O-rings- Although they are the least expensive parts of the air suspension, they are responsible for maintaining the seal where all of the air lines connect. Be sure to replace the O-rings when repairing any air suspension system. I have a 2000 Mercury Grand Marquis with 79,000 miles on it. My air suspension light has been on for a year but the suspension still had air and rode well. My car finally dropped low and the compressor was not working. A new compressor is about $140. Once that is fixed, you can keep throwing money at it (air bags, sensor, relays, etc). I wanted to convert it to springs to get rid of the problem overall. 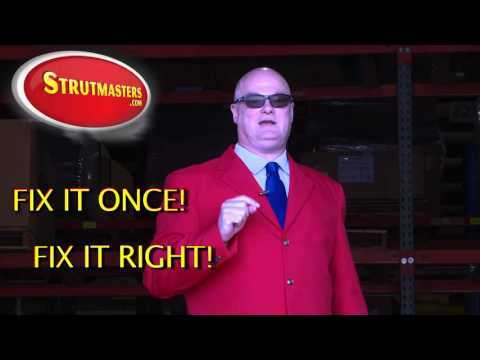 I was going to buy a Monroe conversion kit at a parts store but after more research found Strutmasters was the only company that came with Eibach springs and that were made in the US. The kit arrived within 5 days. The installation was not as fast as they claim, but much easier that I expected. From start to finish, including replacing the front shocks, it took 3.5 hours. The hardest part of the entire process was working in the small spaces to unbolt the rear shocks. I was more than satisfied with the entire process, from shipping time to installation. I would highly recommend this company and this product.